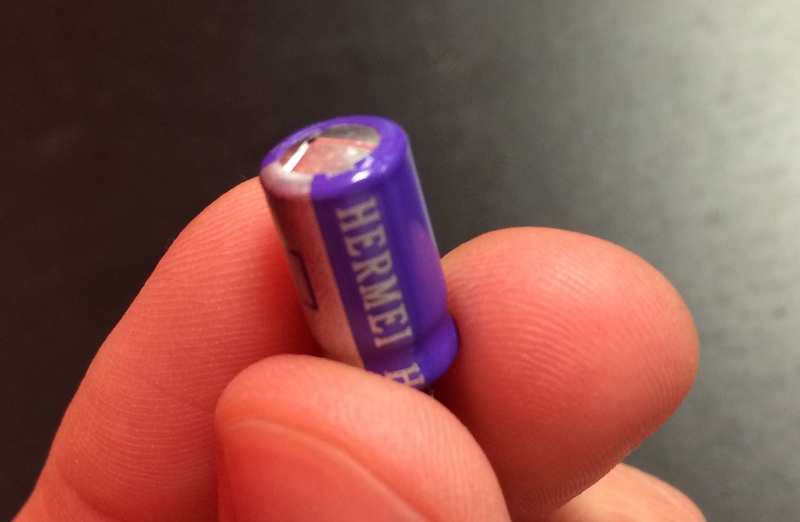 I design electronics for a living and have never heard of Hermei until now. Must be cheap–shame on Asus. De-soldering the Hermei 680uF cap was a pain. We have a Hakko 808 desoldering gun in the office, which normally makes desoldering quick and easy. About 1 second per joint is normal. After removing the bad cap, I heated the clogged solder pads with a soldering iron, and simultaneously used the desoldering gun on the opposite side to restore pads to usable condition. This was definitely one of the more difficult component swaps I’ve performed. If you only have access to a soldering iron, this approach will get by. Our RT-N16 has been back in service for several days now! Next PostCredit Card Hacked, Again? My RT-N16 had the same problem and this fixed it! Thanks! Thanks so much, worked like a champ. 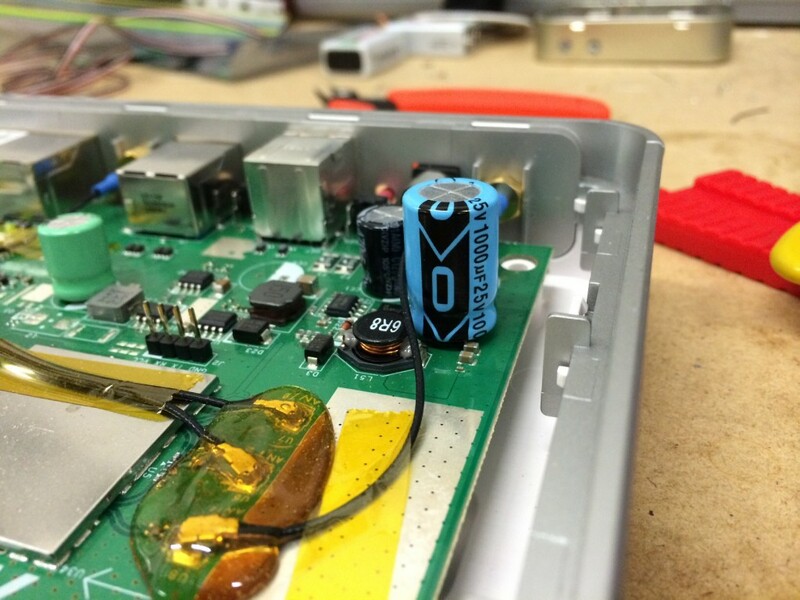 Took me a couple of hours, but I had to steal the capacitor from another dead router. Also noted all the capacitors appear wired backward–white capacitor side on dark board side & vice versa–thanks for those who pointed that out. Also, I used a slightly different technique for soldering. I put a tiny drop of solder on the holes, let it set for a few seconds, then held my soldering gun against the tiny drop as I pushed the capacitor into the board. The tiny drop of solder melts all the way through the hole and the capacitor wire connection pushed through it. Not optimal, but worked. Thanks again, you saved the day!!! I had the same problem. 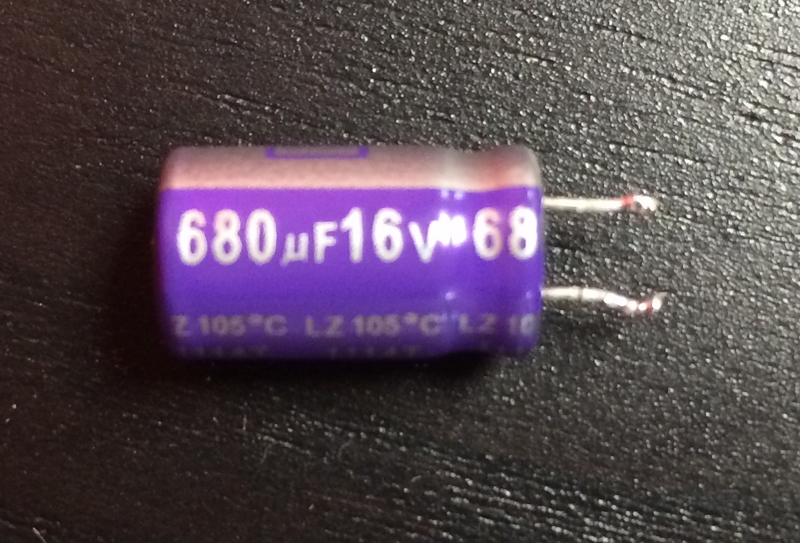 I replaced this capacitor and now it works fine again. Thanks for your hint. Wow. Thanks. I was able to save my RT-N16 because of your post. Replaced with the same capacitor rating you found. Yeah, it was a pain to remove but patience does it. Hope it will last another 2 years. My capacitor replacement method was much easier: I just pulled on the old one until the leads ripped out of it, then silver-soldered the new one onto the tiny stubs on the back of the pc board. I left the leads as long as possible and folded the capacitor with it’s leads around the edge of the board to place it on the top of the pc board. Router works like new again. When I originally got this router I drilled larger air holes in the case and installed a pc fan onto the top of the case and wired it internally to the power connector. I had read that this router gets hot, so I also glued small, finned heat sinks on every IC on the board. In spite of this extra cooling effort, that 680 uf cap still swelled. I would suggest that anyone replacing this cap get one with a much higher voltage rating in the hope that the replacement is physically larger, therefore dissipating heat easier. Well capacitor had black fume on top so it was definitely blown off. Looking in my junk box found a old Lucent IPOffice board and guess what! 4 capacitors 680uf 35vdc, twice as big as the original but I install it on it’s side and soldered 2x 22awg wires to extend on the back of PC board. It did the trick and router is back in service. I have 3 spares for my other Asus. Thanks for posting this, it saved me time. I removed the old cap by heating one pin at a time, rocking the cap back and forth each time. I heated each hole, then used a dental pick to open the hole until the solder cooled. Seems to be leadfree solder, it needed higher temp to melt than Sn-Pb solder. Since the cap is on the 3.3V rail, a lower voltage one than 16V should be OK also, with a lower ESR and higher ripple current rating than the 41 milli-ohm, 930 mA one I used. I just used your post to fix my dead RT-N16. Ordered two of those caps from DigiKey , I have two of those routers so one for the other one when it dies. They were 60¢ each and $3.25 for shipping. It took me about 45 minutes to get the new cap soldered on using Robert Sole’s technique, worked like a charm so far so good. Thanks to you Robert and especially jseaber for this very helpful post. Thank you for posting this . I could fix my router RT-N16 by replacing the capacitor . Restore pads to usable condition was a pain with my basic tools . Still helpful. I was running embarrassing out dated firmware full of exploits, figured I’d been hacked.. and or attacked by solar flares. Somehow managed to tftp new firmware on, was fine for a night. Dead router in morning. Thanks to you/your post I was able to get her back up and routing for $2.13 CAD. Thanks! My ASUS RT-N16 had similar symptoms this week. Didnt want to power on any more. I opened it and looked at the capacitor but couldnt see any damage. However, I did observe heavy corrosion around all 3 antenna connectors. I have no clue who that happened, maybe humidity came into the device, maybe something else, but there was sort of rust of about 1mm visible around all 3. I carefully removed the 3 connectors and cleaned with 90% alcoohol. Plugged them back in, and the thing booted again. Maybe this is helpful for others too.